"Good Morning America" host Robin Roberts is finally responding to her controversial appearance on the cover of an official tourism guide for the state of Mississippi, which recently signed an anti-LGBT bill into law. Roberts, who is openly gay, says she and her partner have always felt comfortable in her home state, "and it hurts my soul to think of anyone not feeling welcome." In her statement, Roberts says she's still proud of her Mississippian roots. "It's always been a deeply held belief of mine that everyone, everywhere should be treated equally," Roberts said. "I'm proud that my beloved mother and father taught me as a child growing up in Mississippi to focus on the many things we all have in common, not our few differences. And what we all deserve to have in common is the right to be treated equally." Mississippi's 2016 official tour guide, featuring a smiling Roberts on the cover, came out before the governor signed the anti-gay discrimination law, which allows businesses, individuals and "religiously affiliated organizations" to refuse service to LGBT citizens. "Roberts advises first-time visitors to enter Mississippi with an open mind," the tourism guide article says, "ready to experience that great food, perfect weather and what she calls 'true Southern hospitality.'" 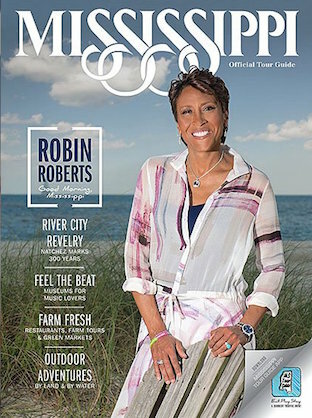 Roberts was slow to issue her statement, which prompted an article by The Advocate titled, "Lesbian Journalist Robin Roberts Is Mississippi Tourism's Cover Girl." The state's tourism industry even got the full "Funny or Die" treatment in the form of a mock ad encouraging tourists to travel to the state where "We have an oppressive law to match our oppressive heat." The video directed users to the state's official tourism website, where Roberts's face is prominently featured. Also Read:Mississippi Passes New Anti-Gay Bill - Will Hollywood Demand a Veto? My father, Colonel Lawrence Roberts, was assigned to Keesler Air Force Base in Biloxi in 1969. During his military career we lived in many states and countries. When Dad retired from the Air Force in 1975, we chose to stay in Mississippi. We fell in love with the Magnolia State for many reasons. Last year well before recent events, I was interviewed and photographed to be on the cover of Mississippi's official state tourism publication. I've often boasted about the beautiful people, delicious food and my picturesque hometown of Pass Christian. My longtime partner, Amber, and I have always felt welcomed in my home state, and it hurts my soul to think of anyone not feeling welcome. It's always been a deeply held belief of mine that everyone, everywhere should be treated equally. I'm proud that my beloved mother and father taught me as a child growing up in Mississippi to focus on the many things we all have in common, not our few differences. And what we all deserve to have in common is the right to be treated equally.